On April 11, a New Jersey couple was awarded $80 million in punitive damages from Johnson & Johnson and Imerys Talc America. This comes a week after a Middlesex County jury had already awarded Stephen Lanzo $30 million and $7 million to his wife in compensatory damages. Lanzo claims his long-term use of asbestos-contaminated J&J talcum powder caused him to develop mesothelioma, an aggressive cancer that attacks the lining of the lungs. This may be an emerging field of litigation against J&J. Though the company facing more than 6,000 claims from women who blame J&J’s talc products for their ovarian cancer, Lanzo is the first consumer to win a case against the company by linking their talc product to mesothelioma. In an earlier, similar trial in California, a jury ruled in favor of Johnson & Johnson. Lanzo, 46 years old, filed a complaint against Johnson & Johnson in 2016, alleging his mesothelioma developed as a result of inhaling talcum powder during daily use. After only one day of deliberations, the jury came to the conclusions that the product did indeed contain asbestos, and that Lanzo’s exposure to it played a significant role in causing his mesothelioma. This is a striking difference to the California trial, where the company successfully argued that their product did not contain asbestos. In this New Jersey trial, J&J maintained they had “reliable” tests for asbestos contamination, and those tests always turned up negative. However, the jury found that J&J deliberately used tests that were too weak to detect the mineral and were actually aware of its presence, hiding this fact from regulators and consumers for decades. The jury assigned blame to both J&J and its talc supplier Imerys—70% and 30%, respectively. The reason this second trial was successful was likely due to brand new evidence revealed in January. The plaintiff’s counsel unsealed hundreds of pages of internal documents showing that J&J discovered asbestos contamination in its talc as far back as 1969. A lead medical doctor within the company even warned them they could be facing litigation in “forty years” if they did not address the problem. 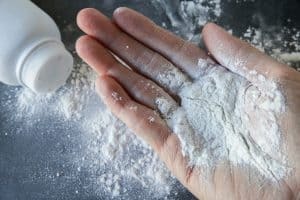 The memos also showed that the company put its talc through multiple rounds of inadequate testing, in an alleged attempt to avoid regulatory penalties. Through these attempts, the plaintiff’s counsel argued, both companies knowingly caused their customers to contract an incurable disease. These internal documents could be a serious threat to Johnson & Johnson and other talcum powder companies, and could open up an entirely new class of defendants for mesothelioma cases. Mesothelioma is a deadly and painful disease. Those who knowingly exposed the public to asbestos must be held responsible for their actions. If you or someone you love has been diagnosed with mesothelioma, talk to the Phoenix defective product attorneys at Plattner Verderame, P.C. to find out your options. We can help. Contact us today by calling 602-783-8793 or filling out our contact form.